While The Color of Sundays is definitely a football story, it also has strong themes tied to the history of American Civil Rights and the role of the Pittsburgh Courier, as the nation’s voice for black Americans during much of the 20th Century. That larger story comes out in my conversation with Paul Guggenheimer, the host of Essential Pittsburgh, a daily talk show on 90.5 WESA-FM, Pittsburgh’s NPR station. He really wanted to know a lot more about Bill Nunn Jr.’s early years, his motivations and the challenges he and other blacks faced. It’s definitely one of my favorite interviews so far. You can listen to it here. 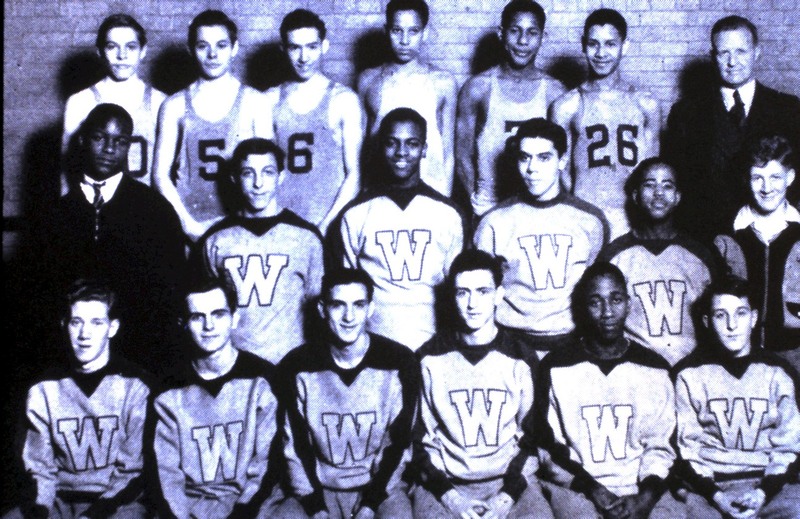 The Westinghouse High School basketball team with Bill Nunn Jr., top row, third from the right. Teammate Chuck Cooper, first row, second from right, went on to become the first black player drafted into the NBA. This entry was posted in The Color of Sundays, Uncategorized and tagged Bill Nunn Jr., Chuck Cooper, Civil Rights, NBA, NPR, Paul Guggenheimer, Pittsburgh Courier, WESA, Westinghouse High School by Andrew Conte. Bookmark the permalink.